Nabarun Borkotoky, a very promising singer from the Assamese music industry, is popularly known for his two massive hit albums, ‘Ninad’ and ‘Khamseng’. This singer has recently released a new single track titled ‘Sagoli’ which is very well received by the Assamese music lovers. The song has been written and tuned by Nabarun Borkotoky, music is by Bijoy Sankar Das. 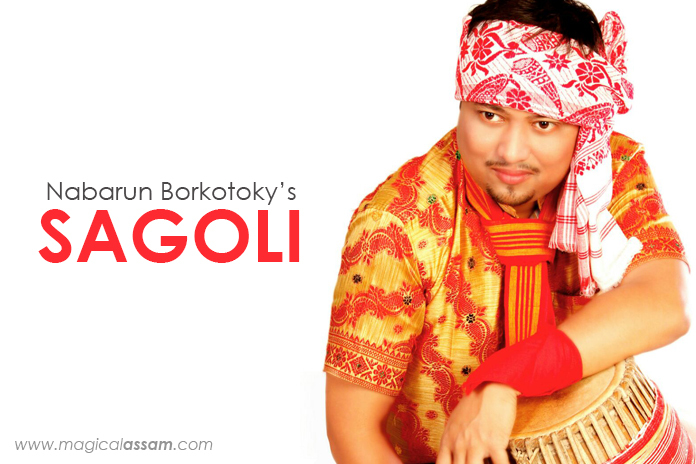 The song has been rendered by Nabarun and Bipul Chetiya Phukon, mixing is by Diganta Bordoloi. The song has been made using some new concept and trend for which it has received high appreciation. The song has become equally popular on various social networking sites also. Singer Nabarun has shared his feelings about the song saying that, the song is based on some comic situations that everyone has faced in love. By addressing the name ‘Gitali’ on the song, the singer has pointed to a goat. He also added that, at present he is busy with his new single ‘Teze Teze’, written by Somiran Malay, tuned by Nabarun, Music is by Jinti Dutta. It is worth mentioning that Jinti is popularly known as the guitarist in Papon’s band. The song will be mixed and mastered by Ibson Lal Baruah at Mumbai. According to the singer, the song will be released before Durga Puja. He has also prepared a song on prostitutes which will be written by Ibson Lal Baruah, tune and music will be done by Poran Borkotoky. According to him, this song will make a positive impact on the society. Singer Nabarun has shared his feelings about the song saying that, the song is based on some comic situations that everyone has faced in love. By addressing the name ‘Gitali’ on the song, the singer has pointed to a goat. He also added that, at present he is busy with his new single ‘Teze Teze’, written by Somiran Malay, tuned by Nabarun, Music is by Jinti Dutta. It is worth mentioning that Jinti is popularly known as the guitarist in Papon’s band. The song will be mixed and mastered by Ibson Lal Baruah at Mumbai. According to the singer, the song will be released before Durga Puja. He has also prepared a song on prostitutes which will be written by Ibson Lal Baruah, tune and music will be done by Poran Borkotoky. According to him, this song will make a positive impact on the society. Nabarun has already performed in various Bihu functions held all over Assam. This time also he has prepared himself to participate in various Bihu functions to be held in different places of Assam.